Your website is your calling card. Similar to your EPK and your social media channels, folks will go to your website to learn more about you and your work. Generally, a lot of journalists or labels look at the following things in the following order: the EPK that's sent over initially, the numbers on your social media channels, then, finally, your website to read more. The website serves as an in-depth EPK of sorts that showcases the entirety of you work in a long-form way. Here are four essential elements of a solid website you definitely need to incorporate. This has little to do with the music industry and everything to do with marketing and where people's eyes are drawn. The general rule is that if your users have to click more than twice to find what they're looking for, they'll leave your site and move onto something else. So, for instance, if a fan goes to your site because he or she wants to read your bio, and there isn't an "about" or "bio" section visible in the menu or submenu, then he or she will likely click around twice before leaving. Everything should be simple and easily found. Similarly, if there are too many options, it'll come off as cluttered and also scare your visitors away. So, instead of having sections for bio, band member list, and discography, try condensing them into one. 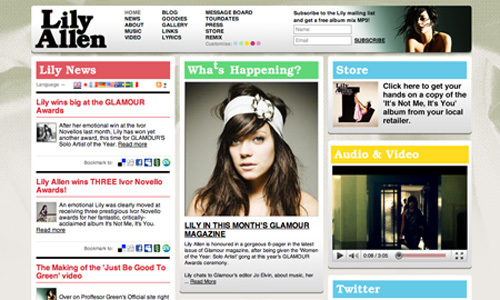 Note how the above photo for an old Lily Allen site has way too many options for the user: a message board, newsletter, etc. These are fine to include but need to be consolidated in one spot (perhaps an "interactive" or "fan experience" section). Another thing to note is that the "Lily News" and "What's Happening" sections are redundant and not necessarily needed. It's not instantly apparent what the company above does, and that's an issue. (There are also two headers with similar sections.) 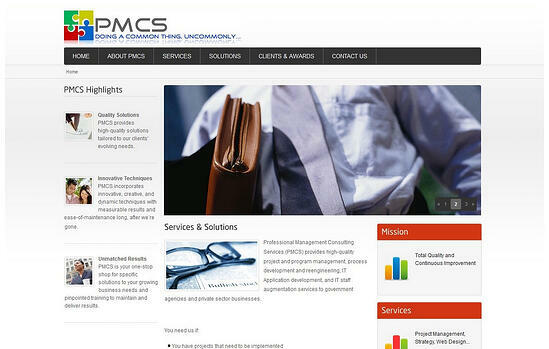 The site instead has a vague statement and vague services. A better example is above – notice the social icons, media links, and any other info a person may need. As an artist, when folks go to your page, they should be instantly met with your photo and any important information, such as a current video or recent release. Any relevant tag lines are also necessary, as is anything that you want someone to know as soon as he or she visits your site. Be simple, quick, and informative. Ensure that you have a good mix of media on your website, and that it's put in a good, simple place. This could be under a media category with video/photo/music subcategories, or in a way that's engaging and fun. For instance, sliding headers on the main page that divide up your latest releases, latest videos, and so forth could be a great way to ensure media is put out in an organized way. Also ensure that your media and website are current and up to date. This can be achieved by scheduling time weekly to update and tweak your site. The website above for Tyme Records incorporates new releases and featured videos really well. It's immediate and in your face while remaining clean and simple. Make sure that your social media outlets are well-placed on your website. This could be at the bottom or top of the site with icons or via a feed or widget. While feeds are fine and can be really cool and beneficial, be careful, as sometimes with websites less is more, and social streaming plugins can easily lead to clutter. Another thing to be sure of is access to your EPK. This can be subtle (in the footer, for example), but it's always great to have an EPK or link available on your website in the chance that press or any other relevant folks want to check out your work. These are just a few elements to ensure that you have a clean website. Remember that simplicity and user-friendliness are key!